We’ve seen quite a lot going on at Franz-Horr-Stadion (currently Generali-Arena) in recent years. New east stand was opened in 2008, under-soil heating added in 2009, new floodlight masts in 2011 and recently the new south-western corner (2014). 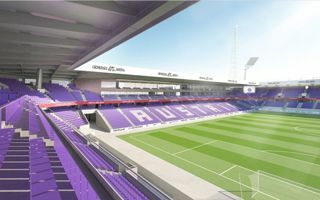 But now, when Rapid are building their Allianz Stadion, Austria presented further, more complex plans for near future. The complete redevelopment plan for Generali-Arena foresees two grandstands demolished after the 2015/16 season: west and north, dating back to 1987 and 1982, respectively. They will be replaced by new two-tiered structures, both equaling in height with the east end opened in 2008. Head to head with Rapid? Presented this time last year, the new stadium of Rapid Wien is widely expected to become the best domestically in terms of matchday revenue. Not by its sheer size (28,000), because even Rapid rarely sees crowds significantly of over 15,000. It’s about the corporate facilities. Allianz Stadion will boast 40 skyboxes. That’s a very high number for a stadium of this size, equaling the number of boxes at PGE Arena, the 40,000+ Euro 2012 stadium in Gdansk. Now, though even smaller in total capacity, it seems Generali-Arena may actually be able to compete for Vienna’s business communities. The south stand has 10 boxes, new north one will have further 28, 2 special ones and four larger lounges. But of course at the end of the day it’s not who has more, but who sells more at a better price. So actual race for revenue may begin later, when both clubs start attracting customers.